Once upon a time I had a problem sleeping. mostly the problem was that I couldn't stop sleeping. I would wake up in the morning and be good to go for a bout 2 hours, then BAM I was groggy and ready to sleep. I would grab a caffeinated drink and be up for a few hours more and it would happen again. Several times I was caught sleeping at work, right at my desk. It was embarrassing and I did eventually find out that I had a sleep disorder and now I have it under control. No more sleep deprivation and no more falling asleep at the drop of a hat. Movies were a rather big pain since it was dark and I was sitting still. However, I also developed a problem with caffeine during that period. 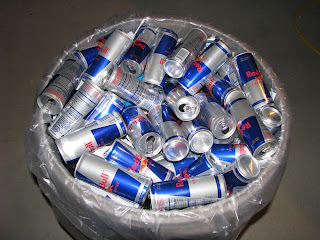 I drank tons of it all the time, and once I discovered that I could by cases of Red Bull at the local membership warehouse store I drank even more, all in a useless attempt to stay awake. Sometimes there is just too much of a good thing.